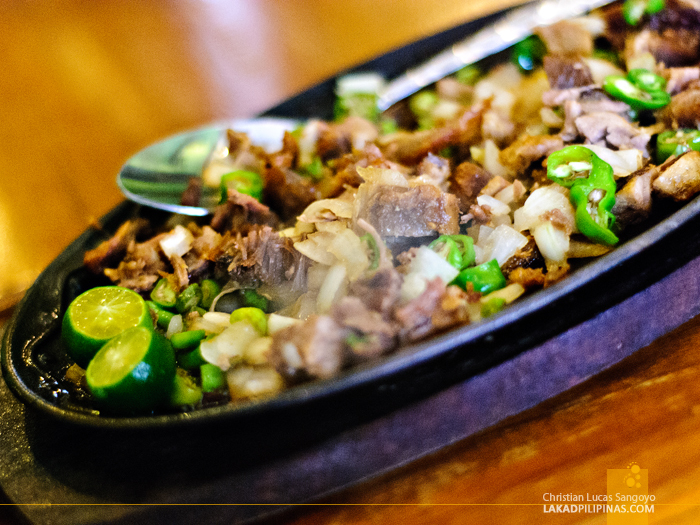 A smoking plate of Sizzling Bagnet Sisig landed on our table and everyone was unable to speak for a moment. The dish looked awesome and I knew everyone was wishing for a bottle of Below Zero Red Horse on hand. Those thoughts however quickly vanished as we realized that we really didn’t order this. 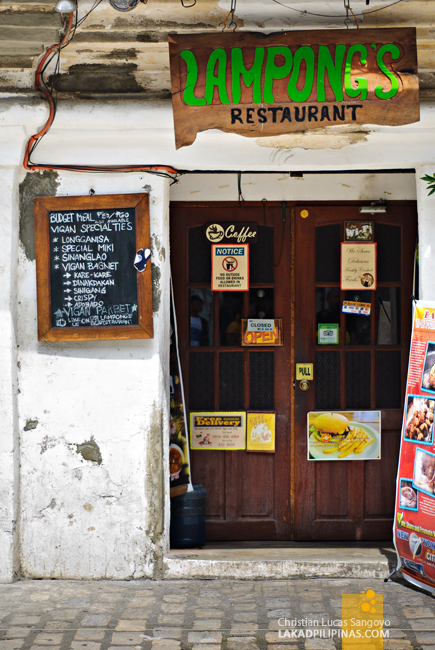 We were at Lampong’s Restaurant, a relatively new food place found along Vigan’s Calle Crisologo. I’ve always wished that there’d be more restaurants lining this historic street in Vigan City, always wondering why the number of souvenir stalls in Calle Crisologo far outweighs the number of places to eat in the area. So it’s a good thing that as of this last visit, cafés and restaurants are starting to mushroom through the street as well. 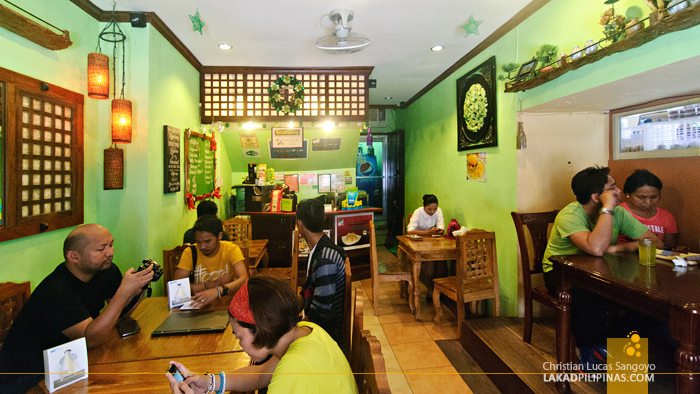 Lampong’s Restaurant is located on the ground floor of one of the Bahay na Bato structures that line Calle Crisologo. Its interior, while quite snazzy, is pretty tight. I think it can only seat about fifteen people before everyone’s elbows start battling for space. 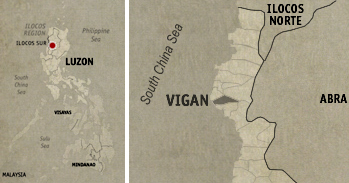 Aside from the usual Vigan specialties like bagnet—which they have numerous versions of, like Kare-Kareng Bagnet, Dinakdakang Bagnet, so on and so forth (check the menu below)—they also serve typical Filipino fares like silog, sizzling plates, pastas and noodles, sandwiches, burgers, shakes and coffee. Since we were five in the group, we decided on ordering their good for sharing servings. That way we can sample a maximum number of dishes without being forced to wash their plates. We asked for their Adobadong Bagnet (Php180.00), Poqui-Poqui (90.00), Pinakbet with Bagnet (Php120.00), a bowl of Meaty Rice with Longanisa (Php80.00) and a cup of rice each. Since we were on a budget, we passed on their soft drinks and simply asked for a cold pitcher of service water. Serving time was average. Photos were quickly snapped before everyone dug in. 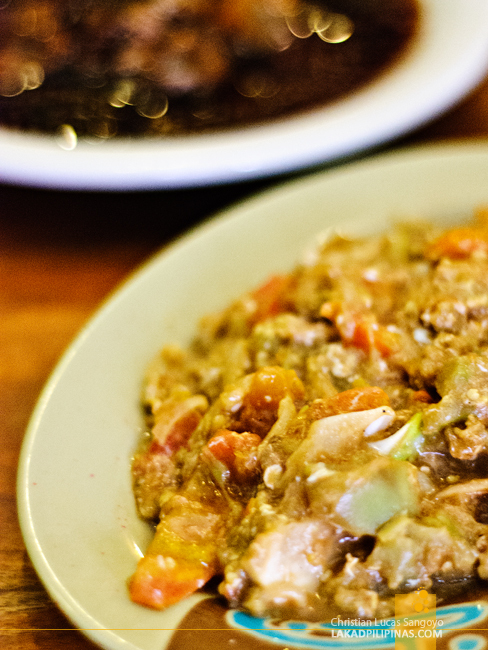 The Adobadong Bagnet sauce looked more similar to pinaksiw na pata than with adobo. It was quite thick, although it was very, very good. The bagnet, which I assumed to be plunked down at the last minute to avoid losing its crunchiness, was nonetheless not that crunchy anymore. 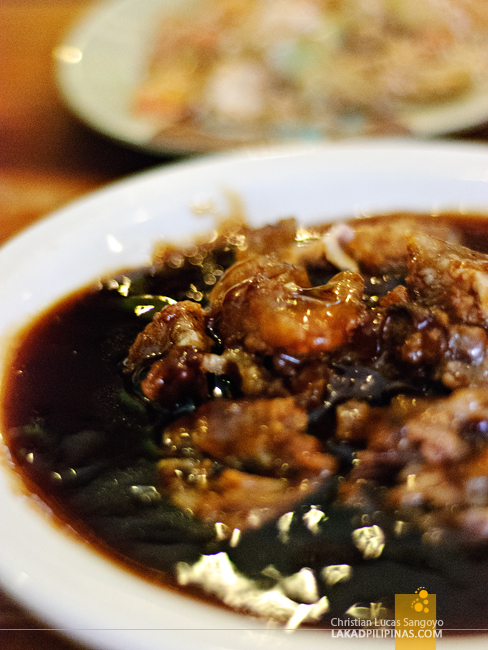 One of our mates got really addicted to poqui-poqui during this trip, so almost everywhere we eat; a dish of this mashed eggplant mixed with eggs is always present on the table. 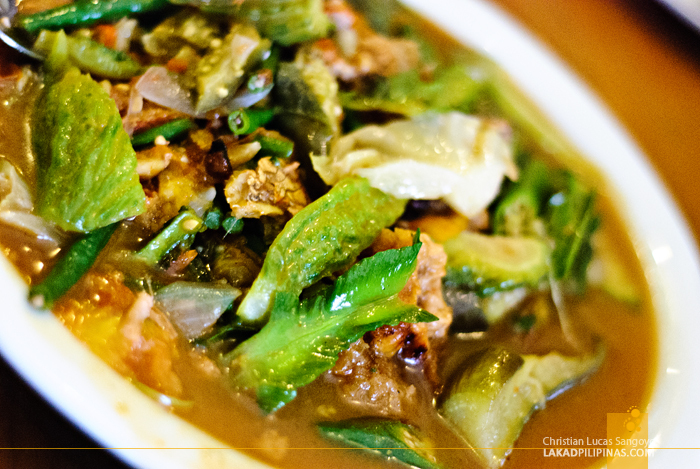 Lampong’s version of this Ilocano favorite seemed a tad too salty though. While not really a fan of pinakbet (I don’t eat ampalaya or bitter melon), I let the others order it since it is a staple dish in the region. But even mixed with chunks of bagnet, as expected, I didn’t like it. Too bitter for me. Surprisingly, the most lauded dish from Lampong’s Restaurant was served not on a plate, but on a bowl. Their Meaty Rice with Longanisa, which is good for two to three persons, depending on how hungry they are, was simply superb. 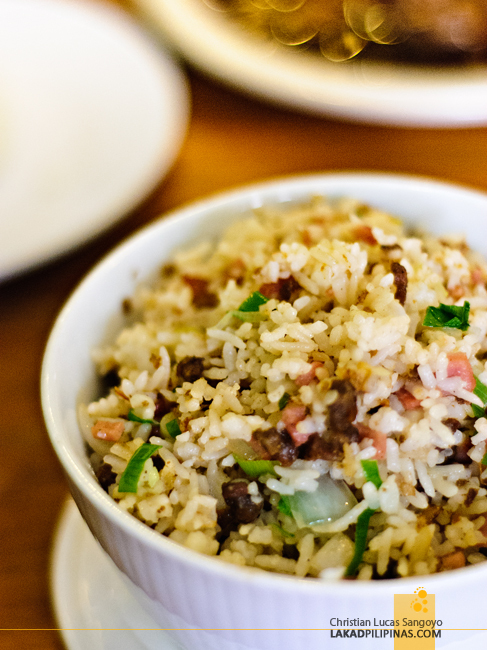 The mix of hams, onions, parsley and Vigan sausages was just spot on. I can forget about all the dishes we ordered, have this, and be happy with my lunch.